So a few weeks ago, we went to Colorado to visit family. My family was having a reunion in the Rockies and my boyfriend Andrew has a couple sisters out there. I’m a nervous flyer, and the prospect of a 4 hour flight was daunting, even though I knew it would be a fun trip. As we were packing the night before our flight, I was running around trying to throw everything I needed into my suitcase and backpack. I was almost ready to go to bed when I realized I hadn’t packed any yarn for the trip. It would definitely be a long plane ride if I didn’t have anything to do with my hands. Luckily my yarn stash is mostly organized, but I still had to figure out what I wanted to make on the trip. 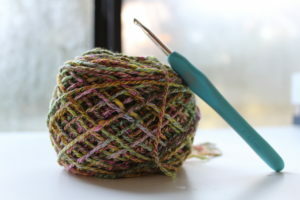 I ended up deciding on Tahki Yarns’ Monet in “In the Meadow”. 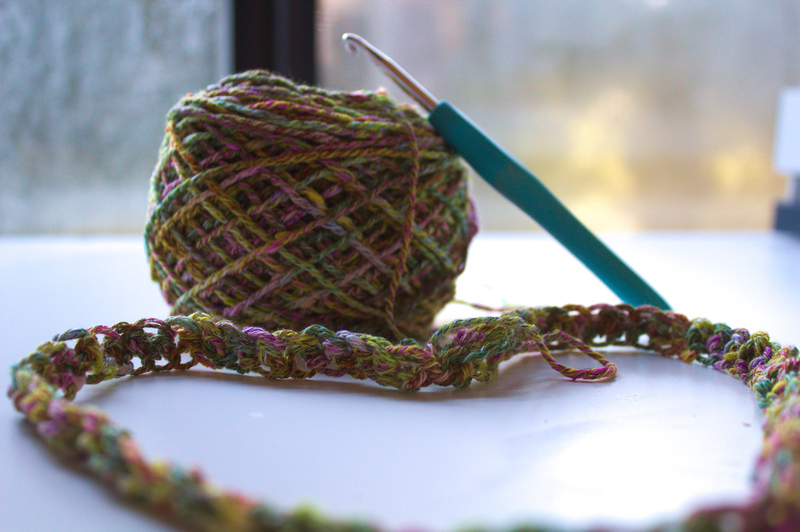 Can I just take a moment to rave about how much I love this yarn? First of all, the colors are gorgeous and it has so much texture! And it’s so soft too! It’s 52% Cotton, 40% Acrylic, and 8% Nylon – another plus in my book because it won’t make me itchy. The downside? It’s discontinued, so finding it in the future will be either difficult or futile. I loved the texture so much I didn’t want to do anything too complicated with the pattern. 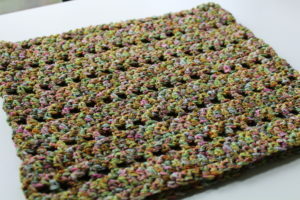 Just alternating rows of single and double crochets with some skips in between to make a simple, yet beautiful cowl. I thought this would allow the texture and yarn to shine. I ended up finishing the cowl on the way back home, and immediately started making another to match. That one I finished yesterday afternoon.